SpiceJet, the country’s favourite carrier, today announced the launch of eight new domestic flights. 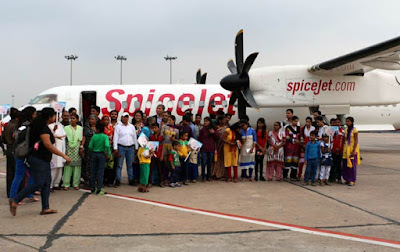 SpiceJet will be connected Kanpur with Mumbai with a daily direct flight and will be the first and only airline operating on the route. SpiceJet already operates a daily flight from Kanpur to Delhi. SpiceJet is offering an exciting all inclusive introductory promotional fare starting at Rs 4099 for travel to Mumbai from Kanpur and Rs 4198 for travel to Kanpur from Mumbai for a limited period. Similarly the promotional fare on Coimbatore Bengaluru can be availed from Rs 2199 and on Bengaluru Coimbatore sector the fares start from Rs 2409. Reiterating its commitment for direct connectivity and on-boarding non-metros and smaller cities onto the national aviation map the airline has introduced a slew of new flights and frequencies. Effective October 8, the airline will introduce new direct flights on the Bengaluru-Coimbatore sector. The morning and evening flights on the sector have been designed to offer convenience to frequent travellers helping them avail same day return trips. Additionally, SpiceJet will also enhance its operations with an additional frequency on the Hyderabad-Surat (second frequency) route. Deploying a mix of its fleet of Boeing 737 and Bombardier Q-400 aircraft on the routes, the airline also strengthen its network across North, South and West India. All the new flights introduced will be operational daily, whereas the evening flight on the Coimbatore-Bengaluru route will fly on all days except Tuesday. SpiceJet has been pitching for more flights to non- metros and smaller cities from major airports in the country. With the new flights, passengers from small towns like Kanpur, Surat and Coimbatore can now also easily travel to a host of other cities both on SpiceJet’s domestic as well as international network via multiple onward connections from key metros.